Home other Jhulelal jyanti and Sindhi Culture: Why Jhulelal Jayanti celebrated? India is the most ancient countries in the world, and it is common homeland to so many religion, communities, festivals, culture etc. Julelal Jayanti is one of the most important festival celebrated by the Sindhis in India. Sindhis are well known for their rich cultural history and Jhulelal Jayanti is one of their old tradition. The day is celebrated to commemorate the birthday of Ishtadeva Uderolal who is known as Jhulelal (saint of Sindhis). According to Hindu calendar, Jhulelal Jayanti is celebrated on the second day of Chaitra Shuklsa Paksha. Generally it is celebrated one day after the celebration of Ugadi and Gudi Padwa. This year it will be celebrated on 7th April (Sunday) 2019. Jhulela Jayanti is also known as Cheti Chand. On the auspicious occasion of Jhulelal Jayanti , the new moon appears first time in month of Chaitra after no moon day. In Sindhi the Chaitra month is articulated as Chet. So the day is popular as Cheti Chand. Actually, “Jhulelal” is the name of their God, who is often referred as “Ishtadeva Uderolal”, “Varun Devta” or Water God. The day of Cheti Chand is considered as the “Sindhi New Year”. Sindhis follow the “Vikram Sambat” calendar and according to this calendar “Chaitra” is regarded as the first month which the Sindhis call as “Chet”. The origin of the “Vikram Sambat” is linked with the name of Hindu king “Vikramaditya”. So this festival is not celebrated as the birth anniversary of Jhulelal but also the commencement of the “Sindhi New Year”. So this festival is celebrated among Sindhi Communities with great fun and fare all over the world. Jhulelal Jayanti is celebrated as the birth anniversary of Sindhi Saint Jhulelal. He is also known by other names such as Ishta Dev and Dariyalal. 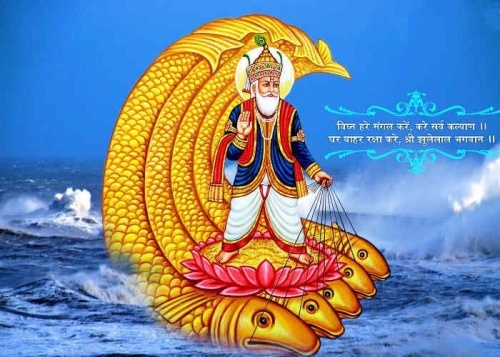 Jhulelal is regarded as the incarnation of Hindu God “Varuna”. It is believed he has lived around the 10th Century A.D. The Jhulelal is has its origin in the Sindh province of Pakistan. At that point of time Sindhi Hindus were badly treated and tortured in the name of religious conversion. The ruler of the Pakistan, Mirkshah forced the Sindhi Hindus to get converted to Islam or die. The ruler has given deadline for the religious conversion. In order to save themselves the Sindhi Hindus turned to God Varuna the God of the River. They underwent penance, prayed and took to fasting; singing songs in praise of their Lord Varuna. On the fourteenth day the Sindi Hindus heard the heavenly voice that they would be saved by the torture of ruler Mirkshah. It was said that a child would be born to Mata Devki in the house of Ratanchand Lohano of Nasarpur, who will liberate the Sindhi Hindus from the cruelty of the ruler Mirkshah. The Lord Varuna had incarnated himself in the womb of Mata Devki and the news was confirmed regarding the conception of Mata Devki. All the Sindhi Hindus rejoiced and thanked God for hearing this news. On the Cheti Chand day, Mata Devki gave birth to a baby boy. It is believed that the child was an incarnation of God Varun. The child was named as “Udaichand”. He was popularly known as Jhulelal – The Swinging Child. As the time flies grew into stature and spirit. Soon the baby boy started performing miracles. After these miracles the Sindhi community believed that Lord Varuna had come to save them from the cruel rule of Mirkshah. Soon, the news of miracles reached to Mirkhah. Who decided to arrest him, but all attempts made by him failed. He was struck by the acts and performance of Jhulelal and realized his mistake. He pleaded to the God “Please save my courtiers” and me and agreed to treat Hindus and Muslims equally. So Jhulelal the incarnated form of Varuna Devta protected Sindhi Hindus. So the Sindhi community started celebrating the birth anniversary of their saviour as Jhulelal Jayanti. This Jayanti is celebrated with great respect and devotion among Sindhi community throughout the world. On the auspicious and pious occasion of Jhulelal Jayanti the people among Sindhi community engages in religious and joyous activities. The festival of Jhulelal Jayanti is an occasion for great celebrations among Sindhi community across the globe. They worship Julelal and perform special “Arti” on this occasion. Sindhi community worship Water as it is the birth anniversary of Jhulelal and he was the incarnation of the God of Water-Varun Devta. Distribution of clothes and food to the needy people are performed and several other charitable activities are performed too. Special hymns are sung to praise Juhlelal. It is the occasion when Sindhi people carry oil lamp, crystal sugar, cardamom, and fruits to Sindhu River and perform Pooja dedicated to Water God. This special puja is known as Baharana Sahib. Coconut milk, sugar, molasses, and fruits are recommended to eat while breaking the fast. Various cultural programs are arranged in several parts of India. Sindhi greets each other saying “Cheti Chand jyon Lakh Lakh Wadayun Athav” on Cheti Chand. Businessman starts new books of accounts on this auspicious day. Sindhi community keep their offices, shops close. This day is considered highly propitious and also thriving. All together Cheti Chand is a festival of joy and happiness. In Sindh, this day is celebrated with both Hindus and Muslims in large numbers for the grand ‘Jhulelal’ procession that is followed by a cultural programme and ‘langarsaab’, free ‘prasad’ for all people, from God’s kitchen. It is about feeding everyone irrespective of their faith, ethnicity, gender and otherwise. The festival is celebrated with abundance and excitement. The auspicious day is also known Jhulelal Jayanti, and marks the arrival of spring. Several Indian communities, celebrate their new year around spring, which is also known as the king of seasons. Celebrated as per the Hindu lunar calendar, Cheti Chand is the day when the new moon becomes visible after a no moon day.